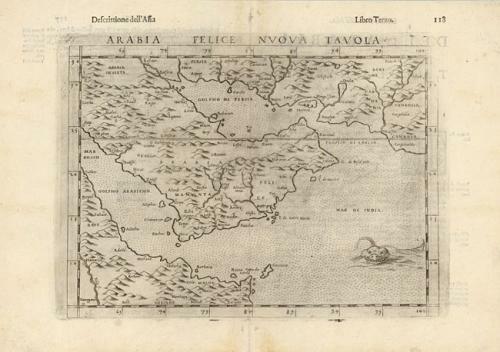 This map is one of the first printed maps to focus on the Arabian Peninsula and is based on the 1548 map of Giacomo Gastaldi. It covers nearly all of the peninsula, but does not include the heads of the Persian Gulf and the Red Sea. The coastlines are more accurate than earlier Ptolemaic maps although the southern part of the peninsula is still shown too wide. A large spurious lake (Stag lago) is shown in the southern region. Major towns are named, although not accurately located, and the rivers are entirely imaginary. This uncommon edition features in the fully stipple engraved sea a large sea monster with a wide grin, gill to gill as it were. This is the edition printed from a separate plate with the plate mark on all four sides. Italian text on verso. Near fine example with a beautiful impression on a full sheet with original margins. A small area of light toning in center of lower blank margin.